In a nutshell, The S.A.M. Method is our way of finding the leaks, weaknesses and strengths of a digital marketing system. It’s done by using your most valuable customer data to deliver your most effective marketing assets via social, automation and mobile marketing. the three growth phases of every business. For a marketing system to run efficiently on it’s own, you must first get rid it of unnecessary “waste”. How much are you spending on marketing that does not have a measurable return on investment? The most valuable asset to your business is your customer. How much are you investing into the relationship with your customers that spend the most money with you? The Pareto Principle (also the 80/20 rule) states that, for many events, roughly 80% of the effects come from 20% of the causes. The actions that get the most results in your business are what you should solely be focused on. If your business is not growing how you think it should, it’s likely because your marketing system is weak in at least one of those three areas. Once we determine which your business is lacking (or missing). It starts with determining who your best customer is and which of your marketing assets have been the most effective. With that information we will then leverage the three most powerful communication mediums to reverse engineer your business’s goals. The three marketing mediums that we focus on is social media marketing to acquire leads, marketing automation to convert them into customers and mobile app marketing to retain them over and over again. Social media now has over 2 billion worldwide users. Using platforms like Facebook and Instagram allow us to put your message in front of people who are most likely to be your 'best' customer. Automation is the key to predictable business growth. We set up automations so that your customer's nurture, sales and service experience happens on its own, which lowers overhead and can increase your margins. There are more mobile devices in the world than there are people. Your brand will essentially be living on your customers' smart device in plain sight 24/7, keeping your business top of mind with them over your competitors. The key to unlocking the S.A.M. Method is to know your CLV, CPA and CPL. Once you know how much each customer is worth and how much it costs for you to acquire one of them, you can ramp up or down your marketing as you see fit. In order to execute the S.A.M. Method you need a powerful suite of tools that integrate with your business and don’t take forever to learn. 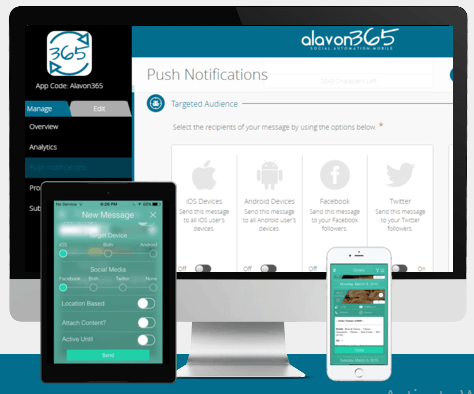 As a foundation, you will be provided with a social media management platform (Alavon Social), marketing automation software (Alavon Blue), a mobile app marketing platform (Alavon Bay), web hosting and email (Alavon Hosting), depending on your needs. Create engaging memes, find hot content to curate and manage your social media profiles from one location. Manage contacts, send newsletters and map out automated communication via email, text and website notifications to your contacts based on their behavior. Send push notifications, track loyalty rewards and build your email list using our powerful mobile app platform. Whether you are a do-it-yourself marketer, you have a tech savvy team member or you have one of our done-for-you management memberships, you get access and OWNERSHIP of all of your lists, data, files etc..
To tie your automations together you’ll need a few other tools at your disposal. The problem is that there are a ton of apps out there popping up everyday and you may not know where to start. That’s why we created a resource to help simplify the process of putting together your digital marketing stack. You don’t need to spend your time signing up for free trials testing out a bunch of apps that may not be the best fit for you. It’s time consuming, expensive and it could be keeping you from taking action. Want a copy of the S.A.M. Method?